Pssst…Wanna Get A Cheap Solar Energy Loan? If the US Department of Energy goes down, it will go down swinging. The agency is facing massive budget cuts but this week it still managed to push out funding for a seed grant that will enable the San Francisco-based solar organization RE-volv to bring its unique crowdfunded solar financing program to low income communities and non-profits. 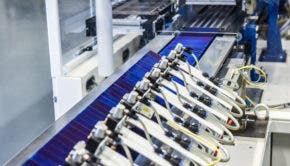 RE-volv first crossed the CleanTechnica radar back in 2012, when it introduced its concept for a revolving loan program for small scale, rooftop photovoltaic (PV) installations. By 2013 it engaged its first client, and added two more by 2014. That snail’s pace level of activity got a huge shot of adrenaline last year, when it received $25,000 in funding plus technical support from a SunShot incubator program in the Department of Energy. The new $60,000 award is also through the SunShot program, which has the goal of bringing the cost of solar power down to parity with fossil fuels. The $60,000 award may not sound like much but it will enable RE-volv to bring its program to communities in California, Wisconsin, and Pennsylvania. Disbursed in increments, the funds will enable RE-volv to reach its goal of installing 100 kilowatts of solar for 10 nonprofits within the next 18 months or so. Again, that might not sound like much, but the RE-volv program fills a critical need for non-profits, which don’t benefit from the tax breaks available to commercial enterprises. The funding also supports RE-volv’s “ambassador” program, which trains college students and leaders in the community to promote crowdfunding drives for the organization’s revolving loan program. Low and moderate income (LMI) households represent 40% of America’s population, but less than 5% of all solar customers. LMI households, non-profits, and government organizations face several barriers to going solar, including limited financing options, low or no credit history, and lack of access to the 30% Federal Investment Tax Credit. RE-volv’s crowdfunding platform empowers people to take direct action on climate change by crowdfunding solar energy projects for nonprofit organizations. Through RE-volv’s innovative revolving fund, proceeds from each solar project help pay for the next, connecting communities around the country in a national movement for solar energy. If you want to get in on the action, join the RE-volv Solar Champion Program now, or apply to become a Solar Ambassador for next year’s cycle. Btw, if you can find any news about RE-volv’s $60,000 award on the Energy Department website drop us a line. CleanTechnica got the tip from RE-volv via email. The agency’s blog doesn’t have anything on it, and its News page hasn’t been updated since last week. Follow me on Twitter and Google+. Image: via Solar in Your Community. Tina Casey specializes in military and corporate sustainability, advanced technology, emerging materials, biofuels, and water and wastewater issues. Tina’s articles are reposted frequently on Reuters, Scientific American, and many other sites. Views expressed are her own. Follow her on Twitter @TinaMCasey and Google+. Mama Mia! AWD & 300 Mile Range: KIA HabaNiro Electric SUV Is One Hot Chili Pepper!